Honda Atlas Cars Pakistan Limited (HACPL) has launched the eagerly-awaited Civic 2019 – 10th generation, in Pakistan. 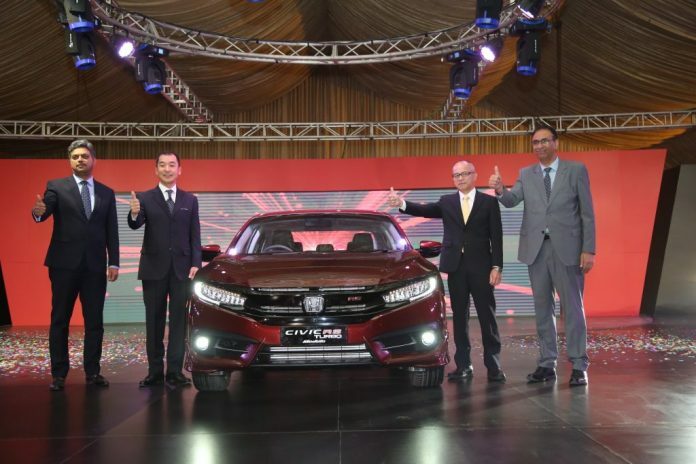 This is the first time Honda Atlas Cars (Pakistan) has introduced the Civic 1.5 RS Turbo Grade. RS (Road Sailing) represents Honda’s challenging spirit, always towards the dynamic and open-minded in creativity but still pursuing the pinnacle of perfection and sophistication. The 2019 Civic has been introduced to the Pakistani market with three grades: 1.8 i-VTEC, 1.8 i-VTEC Oriel, and Civic 2019 1.5L RS VTEC TURBO. A new 1.5-litre DOHC VTEC TURBO engine coupled with CVT, both developed under Honda’s ‘Earth Dreams Technology’, powers the Civic 2019 RS VTEC TURBO variant. The 1.8-litre SOHC i-VTEC series are also together with a CVT developed under the Earth Dreams Technology to offer a responsive driving performance and better fuel economy. In terms of exterior styling, the Civic 1.5L RS Turbo has the enhanced sporty design and athletic stance of the existing Civic range. The Civic RS offers some additional exterior features like a sporty trunk spoiler with LED, high-gloss door sash garnish and dark chrome outer handles. Some of the standard features of the Civic RS include LED Headlights, distinctive C-shaped LED taillights which have been highly appreciated in the region, power side mirrors with integrated LED turn signals and the distinctive Piano black sporty grille. The RS feature changes also include LED Fog Lights and 17-inch alloy wheels. The highlighted features of the three variants include the class-leading safety systems, which include Electric Parking Brake (EPB), Auto Brake Hold (ABH), Vehicle Stability Assist (VSA), Anti-Lock Braking System (ABS), Hill Start Assist (HSA), Emergency Stop Signal (ESS), Reverse Camera as well as SRS airbags.